Cozy Up this Fall with Elegant Pet Furniture - Richell USA Inc.
Fall colors and autumn weather are just around the corner. Together with the changing of the leaves comes cool snuggle weather for our furry friends. Richell’s NEW Elegant Pet Furniture Collection features three pieces that are perfectly designed for the changing of the seasons, and are sure to turn heads this fall when they debut. An elegant wooden pet bed, a beautiful, raised and ergonomic pet feeder, and a great-looking, multipurpose end table crate highlight this new collection. The three dark brown colored works of art fit right in with the nicest home furnishings. They complement each other beautifully, and add both function and elegance to your home’s décor. Developed from some of the most elegant and durable hardwoods, these newest additions to Richell’s ever growing line of perfectly purposed pet products are truly something to behold. The quality of construction and finishing is unsurpassed in the pet products industry. Coupled with their functionality and versatility, these pieces will stand the test of time. If you are searching for the most elegant, highest quality, longest lasting and most durable pet furniture available, then your search is over. Give your pet a raised, sturdy and breathable bed designed with elegance in styling, function and versatility. Expertly crafted with a beautiful dark brown finish, your dog, cat or other family pet will actively seek out any place this bed is placed. What better way for your pet to enjoy a nap on a cool Fall or Winter day, all snug as a bug in a rug in their new elevated and well ventilated bed. 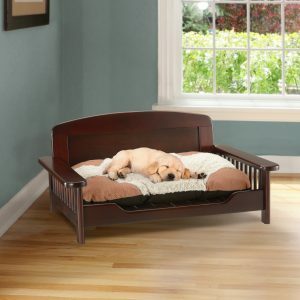 Made of durable, all wood construction with a beautiful dark brown finish, this Elegant Wooden Pet Bed does not disappoint. It is so good looking and well styled that it seamlessly blends in with the finest home furnishings. The bed weighs 22 lbs. and is easy to assemble. It fits a 20 X 30” cushion (Cushion not included), and is made for pets up to 44 lbs. Richell’s Elegant Pet Furniture Collection provides pet owners both a great excuse and justification for allowing pampered pets to spend more time in family rooms, living rooms, kitchens and other gathering places in the home. After all, pets are members of the family. A major reason pet lovers have pets is to be around them as much as possible and enjoy their comfort and company. Why relegate their beds, food stations, playpens and other items to areas of the home where few people can enjoy and interact with them as they eat, sleep or enjoy play time. Richell’s Elegant Pet Furniture Collection meshes perfectly with existing home furnishings. The pieces won’t stick out like some pet furniture, and they allow opportunities to become closer to your pets and better share your lives with them. Most pets want to be as close to their owners as possible. 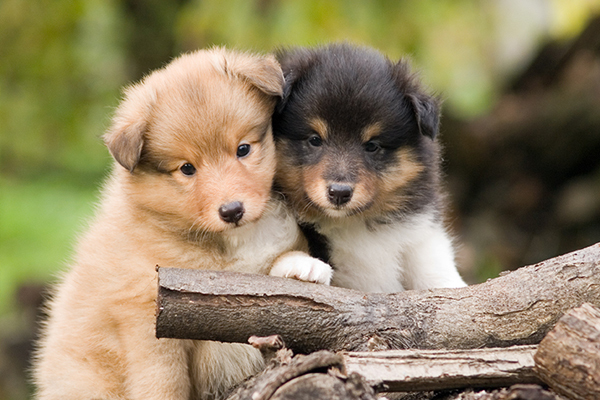 For dogs, we are the leaders of their pack and they want to please us as much as possible with their love and loyalty. What better way to provide them a safe containment and leisure space in a living or family room than with Richell’s Elegant Wooden End Table Pet Crate. 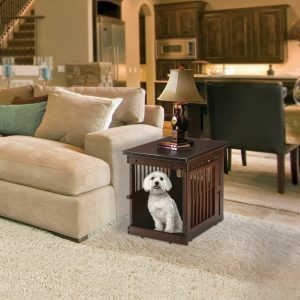 Featuring all wood construction and a dark brown finish, this pet and dog crate end table not only acts as an elegant piece of furniture, but it serves as an excellent playpen, crate or private space for any pet. The door can be fully opened for easy pet access, and includes a side stopper for keeping the door open. A removable, sliding tray is included for easy cleaning. The crate size is 24 x 18.1 x 20.9”, it weighs 24.9 lbs. and fits dogs up to 17.6 lbs. Pet products made of high quality materials that are durable, highly functional and don’t cost a small fortune, can be hard to find. Richell USA Pet Products strives to deliver on all of these fronts. And our exceptional track record developing pet and dog crates, pet gates, dog kennels, pet pens and many other pet products with major retailers speaks to our commitment to customers to be the best pet products manufacturer and distributor in the industry. Pets can drink water and digest food easier when they eat from elevated feeding bowls. Richell Pet Products features both medium and large ergonomically designed pet feeders that also double as storage units and complement any room décor. 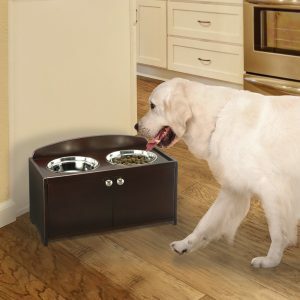 Crafted from durable, all wood construction with an elegant dark brown finish, Richell’s medium and large Elegant Wooden Pet Feeder will also allow for the organization of toys, treats, leashes, grooming supplies and more in the convenient storage cabinet below the feeding bowls. Each unit also includes two stainless steel bowls. The medium pet feeder weighs 8.1 lbs. and is for dogs 8 – 44 lbs. The large pet feeder weighs 15.4 lbs. and is for dogs up to 88 lbs.